This is Chapter 2 of a multi-chapter story. Punctually at four the next day, Fenderis and I turned up at the Bus Stand, awaiting the arrival of the rest of the family. “To think we could’ve been pub-hopping right now!” said Fenderis wistfully. “Is that them?” he asked, looking into the distance. I followed his gaze and saw what looked like a spreading bushfire. In a few minutes, the appearance of Papa Jormund, the Queen Tigress and Ariel confirmed that it wasn’t a bushfire, but rather my beloved family. I smiled weakly in their direction. Fenderis tried to pretend he was looking very fixedly at a passing cat. “Where’s your luggage?” came the first salvo. And before I knew what had hit me, I was saddled with two large handbags each of which must’ve weighed as much as Brokk’s Pig. “What’s he doing here?” asked Ariel, looking at Fenderis. I was too busy tottering about on the footpath, a handbag on each arm playing havoc with my center of gravity, to reply. Personally I thought her practice of referring to my mother as “mother” was damned presumptuous, but I let it go. I looked skywards in despair. As it turned out, this was a bad move given my precarious balance, because I keeled over and fell on my back onto the pavement. Fenderis and Papa Jormundgandr helped me back to my feet. “When does the Bus arrive?” asked Papa Jormund irritably. “Let’s go corner the travel agents,” said the Queen, and we followed her to the Travel Agent’s office, a hole-in-the-wall of the State Bank Building. “When does the Bus to Freyja’s shrine arrive?” Papa Jormund asked the sleepy octogenarian at the counter. “To where?” he asked, and dozed off again. “To Freyja’s shrine. District Beed. By the World Tree, I’ll bite off your head, you crusty ancient, if you don’t answer,” I said, bonking him on the side of the head with one of the handbags. He fell off his stool and didn’t move for about five minutes. Then a chirpy little midget sucking on a lollypop, who might have been the ancient’s great-grandson showed up and demanded to see our tickets. “Bus will come at WorryGem’s Office, opposite,” he said, pointing across the road. “But we bought the ticket from you,” said the Queen Tigress, not liking this one bit. “Yes but the bus is operated by WorryGem,” he clarified, and went back to sucking his lollypop, making it clear that as far as he was concerned, the conversation was over. Our group turned wearily and crossed the road. I knocked over two motorcycles and one scooter with my bags while doing so. Once there, we located WorryGem’s office, another hole-in-the-wall operation. “Bus…Freyja’s shrine…when…here?” I asked cryptically. “Six,” the ferret who was operating the office said brusquely. “The ticket says FIVE,” protested the Queen. “What is that supposed to mean? Why do you write five on a ticket when the bus arrives at six? This is ridiculous. It’s a crying shame. You should be…” began the Queen Tigress, but Papa Jormund succeeded in calming her down and guiding her away before she could go any further. “Now what do we do?” asked Fenderis. The motion was seconded and carried. We removed to a nearby samosa-joint. At six we were again standing before WorryGem’s office, awaiting the arrival of the mystical bus. “Any time now,” clarified the ferret. Fifteen minutes later the ferret repeated the same line. Another fifteen minutes later he collected all our tickets. Finally at 6:45 the Bus actually made an appearance. “It doesn’t look too bad,” I said. As it turned out, I was talking to myself; everyone else was already on the bus. I looked around for a porter to help me carry the luggage in but there wasn’t any. So I pushed it in myself and stepped gingerly into the aisle. As I might have expected, the family had successfully isolated me. I’d looked forward to a pleasant journey with myself in the window and Ariel by my side, with the two of us a safe five rows behind the parents and Fenderis. As it turned out, she sat next to the Queen Tigress, who had bagged a window seat, while Fenderis sat next to Papa Jormund who had done likewise. I groaned and found a vacant seat across the aisle from Fenderis. The window seat next to me was empty as well so I put down my luggage on it and made myself comfortable. In all fairness the first leg of the journey wasn’t too bad. There was a decent breeze, I had space to stretch my tired body, and I even brought out my iPod and listened to a bit of Van Halen. The first jolt came when we had just left the city. The bus took a stop and a large, dark, oily man entered and informed me that he had a ticket for the window seat next to me. With a groan, I lifted the luggage onto my lap and let him sit. After the bus started moving, Mr. Oily gave his head a sudden jerk, showering me with dandruff. “I don’t know, but if I don’t do something about this I’ll start looking like someone from Nightmare on Elm Street,” I replied in the same language. This deft manoeuvre on my part did work, but after a while Mr. Oily rested his ample arm on the armrest, edging me out completely, and dozed off. I pushed back with a vengeance, which not only awakened him, but also prompted him to favour me with a fine sprinkling from his vocabulary. Fenderis, who likes to keep a track of such things, noted some of the more coulourful words on his cufflinks for future reference. About an hour into the journey, it struck me that something was wrong. Then the bus veered off whatever road there was. 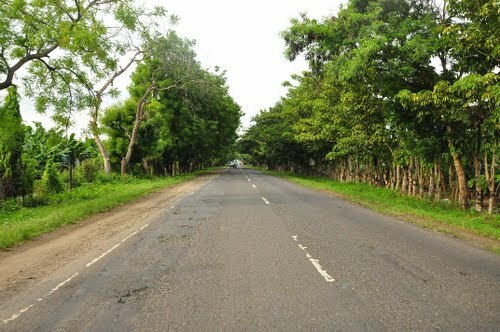 For some reason, we were now neither on the Expressway nor the Old Road, but on a village Dirt Track. The Bus then rolled to a standstill at what appeared to be a dead end. It was now pitch dark outside, but I could vaguely make out mysterious figures engaged in conversation with the conductor of our bus. Some more people entered here. One bloke was left standing, even as the conductor muttered vague threats about “one seat being left empty”. Back on the last seat, a couple of passengers were making uncomplimentary remarks about each other’s ancestry. Then the bus rolled on. It seemed to have an uncanny knack for shoving itself into every bump or pothole in the road that it could find. Another half-hour or so later it stopped again. “Dinner break, twenty minutes,” said the conductor, a ferret with a moustache. The bus slowly emptied itself into the lawns of the Hotel Putnam. There was something vaguely familiar about the layout. “Is this the old Hotel Putnam at which all buses stopped before they put down the Expressway?” I asked Papa Jormund. In a way, of course, that was exactly the case. There had been a time when the Hotel Putnam played host to almost every traveller on that stretch. The lawns had been well-manicured, the fountains gushing and you couldn’t find a place to sit for love or money between 9 and 11 at night. But today, though it was 9:30, the place looked like a ghost town. Everything had a run-down look to it. The grass on the lawns was over-grown, the fountains decrepit and empty seats as far as the eye could see. There was little to remind one of the glory days of waiting for an hour to get one’s order, or of the Hotel from where the elder Elvers used to make it a point to buy their Chicken Tandoori. “Still, the food might be good,” I said to no one in general. By now the Queen Tigress and Ariel had made their way off the bus. Neither looked too pleased. I’d say they were shaken, but that would just be the literal truth. “This bus is terrible,” came the verdict from the Queen. Fenderis and I exchanged meaningful glances, but avoided laughing out aloud at her unfortunate choice of words. “Let’s um, go in, shall we?” Fenderis ventured, and led us in. No one was very hungry. Papa Jormund had some bread, I tucked into some noodles and even Fenderis contented himself with only one helping of mutton. The ladies looked too miserable to be hungry. Even my mother, for a change, looked contrite and tried to explain to me why going by train had not been feasible. Dinner over, we boarded the bus again. To my chagrin, Mr. Oily had shut the window. The atmosphere was now so close and Mr. Oily himself so deodorant-deficient that I almost suffocated. Slowly, however, sleep did come to my tired eyes. At midnight, the bus jolted to another halt, once again in a place that bore a striking resemblance to the desolate lands of Aunt Hel, keeper of the underworld. In the fond hope that someone would get off the bus, I rubbed my eyes and poked Mr. Oily helpfully. “What the…?” he began groggily. He gave a low growl. “I do need to….go,” he said, “and this looks as good a place as any.” With these words, he was just about to get out of his seat when there was a sudden influx of babies, women and the occasional male, into the bus. Fenderis, who had also been awakened by the stop, looked on in thinly disguised horror. I imagine I looked much the same. Papa Jormund was clearly bewildered. The ladies slept on. After about forty-seven crying babies, twenty-three ridiculously young mothers and eleven rat-like men had entered, the door of the bus closed and it began to move again. The new entrants settled themselves in the aisle. Some stretched their babies out in comfort and sat by their side. Others sat leaning against the seats of passengers. One of the ridiculously young mothers tried to use my foot as a pillow for her baby. I recoiled and protested vehemently. I sighed. The ferret-like conductor was now taking exorbitant amounts of money from the poor villagers for the privilege of standing or sitting on the floor of what was not a very pleasant Bus to begin with. But with the aisle crammed to the full with the villagers, there was no way Fenderis could get at the ferret. Gnashing his teeth with bootless anger, he turned and looked out of the window. He opened it a few inches. Then the idiot sitting in front of the Queen Tigress called out to the conductor. “I can’t get my window closed,” he said. The conductor came tramping down the aisle, stepping on the feet of numerous babies along the way, and began closing all the windows one by one. Mr. Oily, who seemed to have an unhealthy respect for the ferret, promptly closed his window too. I groaned some more and resigned myself to more discomfort. The rest of the journey was relatively uneventful. From time to time, a baby would cry out, or two young mothers would strike up an interesting conversation about the family buffalo’s philandering ways, which made for a terrible night’s sleep. Nor was it very pleasant when Ariel and the Queen Tigress woke up to find three dusters, two sacks of red chilly, a gallon or two of baby drool and a broom on their feet. The atmosphere got closer and closer. I felt like a slab of serpent-meat being roasted over a spitfire. From time to time I’d fall into a doze and have a dream or two, always an unpleasant one. But at about 6:30 the next morning, the Bus eventually came to a stop at the village that houses Freyja’s shrine. I picked up my two beastly burdens and negotiated the teeming multitudes at my feet to make me way out onto the road. The rest of the family followed, ashen-faced and shaken. “That we are going back,” Fenderis continued. “In that bus,” concluded Ariel. The Queen Tigress turned her flashing eyes on us. Vivid descriptions. Subtly humorous. Nice choice of names. I can't believe it is your first story.